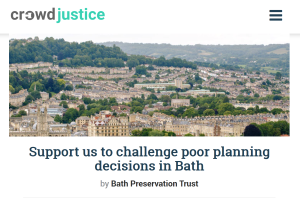 Bath Preservation Trust (BPT) has launched a crowdfunding campaign to establish a ‘legal fighting fund’ to enable it challenge poor or irrational planning decisions in Bath as and when they occur. Bath Preservation Trust is a charity promoting high standards of planning and architecture in Bath, striving to ensure the future success of our special heritage city through conservation, education and museums. We recently had to give up a judicial review case due to exposure to unacceptable financial risk. We want to set up a ‘legal fighting fund’ that will be ring-fenced and used only to launch future legal challenges against poor or irrational planning decisions in Bath as and when they occur. The scheme in question (a student accommodation scheme to be built over the car park of Bath Cricket Club) was approved by Bath and NE Somerset Council’s Development Management Committee on the basis that it brought public benefit that outweighed heritage harm. The scheme is not only contrary to national flooding policy but we believe will harm both the Conservation Area and the World Heritage Site with its excessive scale, bulk and height in a sensitive city centre location. We cannot see how the ‘public benefit’ of student accommodation units (of which there are already many in Bath) and a new cricket school overcomes the harm identified by the council’s own planning officers and Historic England, and therefore we attempted to challenge the legality of the decision made by elected councillors. Once the full extent of the financial exposure should we lose the case was clear, we had to pull out of the process. The money we had raised through publicity for the judicial review was sadly not enough to cover the ongoing costs or risk of losing the case. Having to pull out of the judicial review was a great learning point, and as a result we are seeking to build a fighting fund. This means we can quickly move to instruct Counsel, especially as a judicial review pre-action letter must be sent within 6 weeks of the decision being issued.